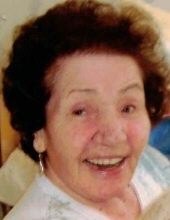 Anna Popil Jarema, 91, wife of the late John Jarema and daughter of the late Mychajlo and Maria Popil passed away peacefully on Thursday April 4, 2019 at Douglas Manor Nursing Home, Windham after a long illness. She was born on March 7, 1928 in Peremysel, Poland and came to the United States in 1951 and has lived in Willimantic. She was employed by the American Thread Company and later by the University of Connecticut before her retirement. She was a life long active parishioner of St. Mary’s Ukranian Catholic Church in Willimantic. She is survived by her son, Raymond Jarema and his wife, Anna of Berlin, a daughter, Daria Zelenczuk and her husband, Bill of Sudbury, Canada; four grandchildren, Jason Jarema and his wife, Lauren, Nicholas Jarema and his wife, Kristen, Bill Zelenczuk and his wife, Jennifer and Yolana Mahony and her husband, Christopher; and four great grandchildren, Billy Zelenczuk of Canada, and Quinn, Mia, and Luke Jerema of CT. We would like to thank the nurses, aides, and staff at Douglas Manor, Windham for their compassion, love and care they have shown over her many years in their care, especially Claire, Lisa and Lynn. A debt of gratitude to a very special nurse, Holly for her professionalism, love, commitment and friendship to her and to the family. Relatives and friends may call on Sunday April 7, 2019 from 6 to 8PM at Bacon Funeral Home 71 Prospect St, Willimantic with a Panachyda at 7PM. A Celebration of the Divine Liturgy will be held on Monday April 8, 2019 at 10AM directly at St. Mary's Ukranian Catholic Church 70 Oak St, Willimantic. Burial will be in St. Joseph Cemetery, Windham. To send flowers or a remembrance gift to the family of Anna Jarema, please visit our Tribute Store. "Email Address" would like to share the life celebration of Anna Jarema. Click on the "link" to go to share a favorite memory or leave a condolence message for the family.